This fabulous condo is an enjoyable place to stay! Nice full kitchen for those who love to cook with a view! Pali Ke Kua is an awesome place to stay! Enjoy the light and bright living room - island style. The decor has an island theme. A King Size bed in one bedroom, a queen in the other. Create your favorite island dish in the fully-equipped kitchen, and enjoy your meal with the beautiful distant ocean view from the dining table. 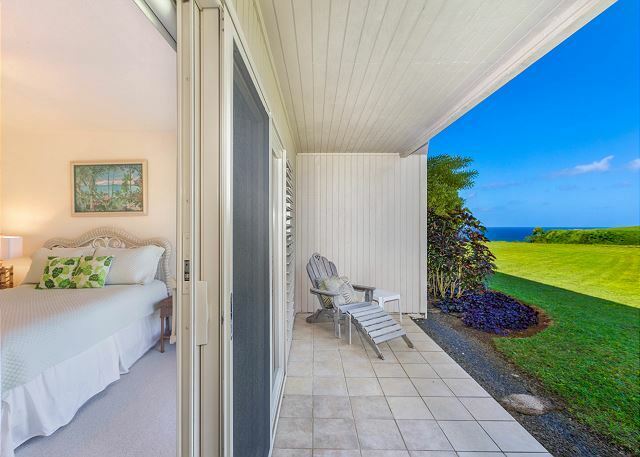 This well-kept secret is located right above Hideaways Beach in Princeville. Just walk down the path and you will be on pristine white sand with that deep azure ocean in 5 minutes. While you walk you will have to stop to gaze at the celebrated “Bali Hai” view first. 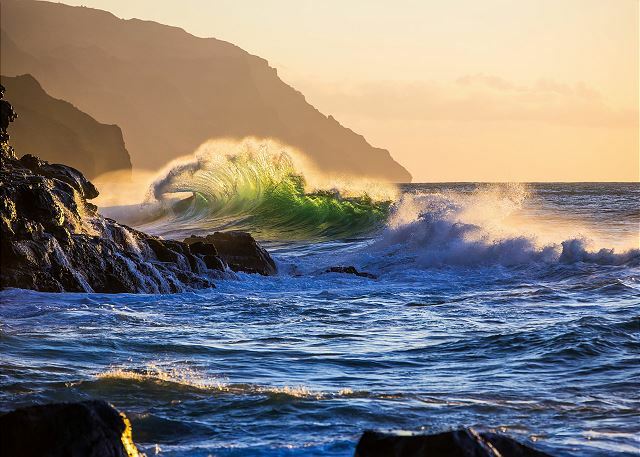 Known as “Makana” to Hawaiians, this stunning mountain configuration was captured in the original “South Pacific” and is one of Kauai’s landmarks. Hideaways Beach is a true “hideaway” spot, always quiet. Fun to just laze in the sun or under the palm trees and perhaps watch the world class surfers catching the waves, please be advised there is no Life Guard on Duty..
Hello, we loved our stay ! Our son was married on a nearby beach and we were able to enjoy so many adventures using this condo as our home base. We would love to stay again! It was clean, bright and welcoming. We made use of the kitchen and the beach umbrella! Aloha! Wonderful location for our trip to Kauai. 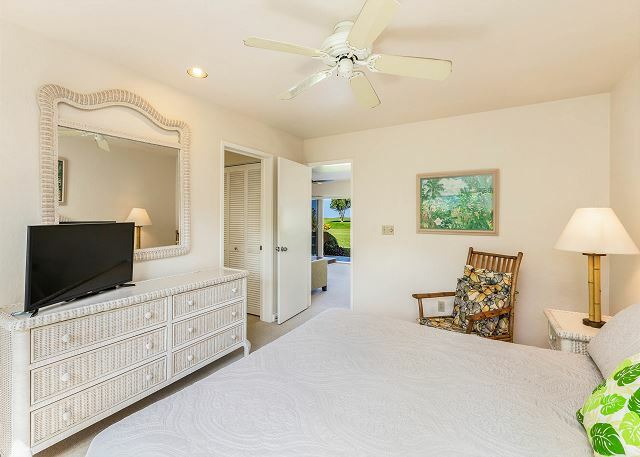 The property is comfortable and situated perfectly to explore Hanalei Bay/Town, The Na Pali Coast and the surrounding beaches. 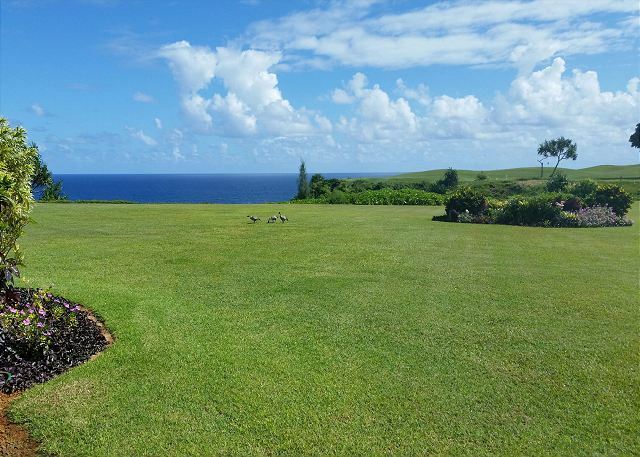 Beautiful ocean views right out of the back of the property. Would definitely come back! We had a great stay in condo #138. The location was perfect. The bed in the one bedroom wasn't the best and the noise of the people walking around in the condo above was a little annoying but overall we had a wonderful time and would certainly return to Pali Ke Kua!! Large clean comfortable unit in a good location. It has partial ocean views ;to see the sunset you have to walk outside to the end of the complex. Enjoyed seeing albatrosses landing on the golf course. A little more attention to detail would be appreciated...replacing burned out lights, non functioning tv cable(fixed after we called Spectrum),dvd player not hooked up. If more than one couple staying then more wine and water glasses needed. Nice collection of beach & snorkeling gear. A gas grill would have been great...several of the other units have them. A hike down to the “grilling area” is an adventure, OK if you want to eat down there. Working with Lizzie at Princeville Vacations was seamless/answers direct and convivial. Unit 138 is an end unit facing the ocean w great morning and evening skies. The creamy white berber carpet was spotless/bed firm and comfortable. Kitchen space adequate for a week or month stay..we stayed 10 days. Plenty of beach towels/fresh beach chairs, etc. Parking 100-150 feet away. Our 6th stay on Kauai, Pali Ke Kua our first in a condo..would 110% rent it again. Unit was as described, water view was very nice, unit was very large so you had plenty of space, living room furniture was more comfortable than most. Views from the unit are nice, with a large, open play area right off the porch. Sunset views are available at the end of the unit too. The unit also had beach chairs, an ice chest and beach toys/snorkel equipment so there was very little needed. An added bonus-living area in this unit gets a few hours of MORNING sun (when it's cooler) but the living area windows are fully shaded in the afternoon (when it's warmer), so the unit is comfortable throughout the day. Management company was very helpful and easy to work with. Only thing we really would have changed was 1)softer sheets and 2)complex doesn't really have a very good grill set up for the fresh seafood available. They have a grill, but it isn't in very good shape and is a long walk. This place was wonderful. 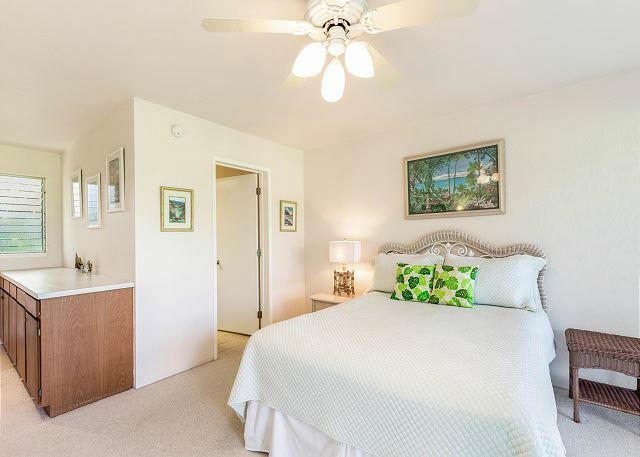 The location and the unit were perfect for a relaxing Kauai holiday. The pool and proximity to the beach were excellent. Centrally located, very clean, nice beds, wonderful view, short walk to a very nice beach (at St. Regis), I'd definitely stay here again. Pool was nice. We really enjoyed the hot tub after all of our hiking. Grocery store, and gas station and restaurants close by. The restaurant at this complex is very good, as well. The condo was great, but it would have been nicer if a key to the swimming pool was included. Aloha Paula, I wish you would have called me, there is a key card (looks like a credit card) that's for the pool. If it wasn't there, I would have brought you one right away. I'm glad you enjoyed Pali Ke Kua 138. Condo was really clean , very well organized ! morie then complete everything was included inside and it made and amazing difference ! The localisation of the condo is perfect very nice view close to everything ! Only sad thing is the fact that we couldnt stay longer only had one week off ? First trip to Kauai for honeymoon, manager was easily available if needed. Enjoyed the peace and quiet of the rental and area surrounding. Wonderful Trip! We stayed for 3 days at this condo. The condo was great, everything we could need. There was ocean view from the lanai and beautiful views of the Nepali coast a quick walk to the edge of the lawn. When we weren't hiking Napali coast or visiting one of the many beautiful beaches, I loved sitting on the lanai every morning and evening looking at the water. Hideaways beach is awesome and a short walk away. I snorkeled while my husband laid in a hammock he set up. There is a pizza pub you can walk to in a few minutes with pretty good pizza and the st Regis within walking distance which has a nice patio over looking the water where you can get drinks and food. Overall great condo in a great area, we had a great time. Back after 29 years! Great mini vacation. Rooms were clean location was great, loved the area and sunsets! This is a magical place. 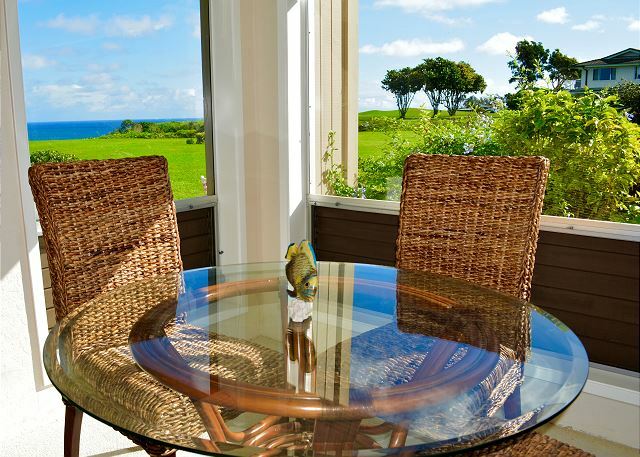 The scenery, the landscaping, the ocean view provide a sense of peace found only in a few places. My wife and I enjoyed our second visit to this unit. The accommodation is very comfortable with a well equipped kitchen. 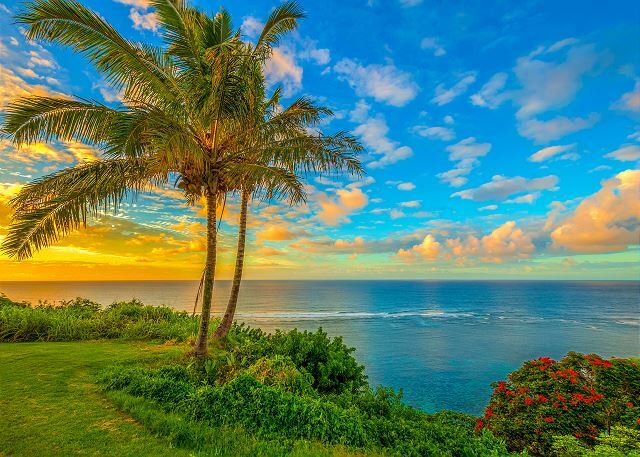 We have been to Kauai many times so we have travelled the trails and taken most of the trips offered to tourists. The most memorable is a helicopter ride which allows you to view most of the island including the inaccessible places for pedestrian visits. 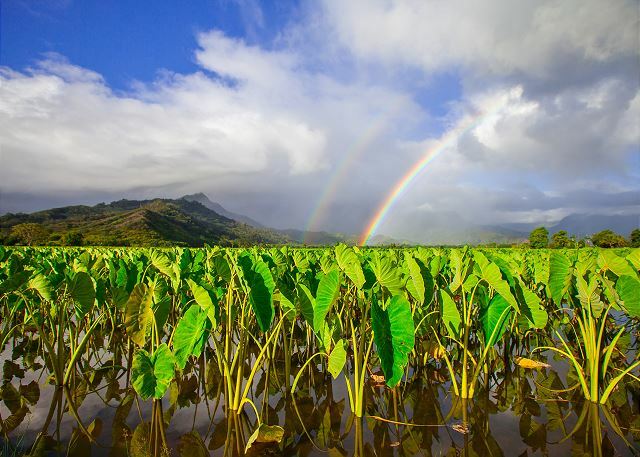 Anyone coming to Kauai for the first time would find Pali Ke Kua very suitable for a most enjoyable and peaceful vacation. I've stayed in PKK 138 six times, and it is a very comfortable, convenient, and pleasant place to stay. 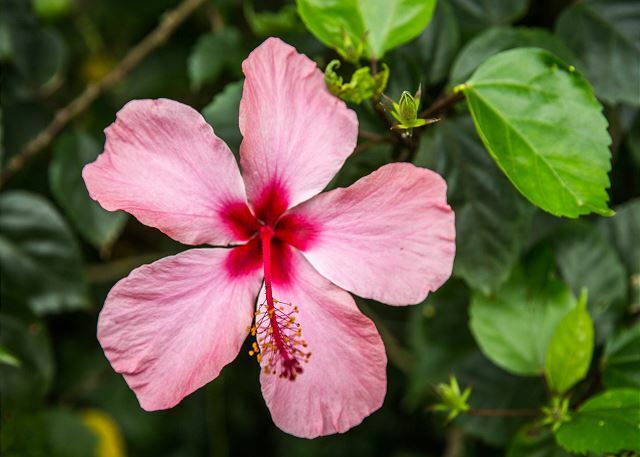 Pali Ke Kua is well maintained and managed, with beautiful grounds. You will not be disappointed. The property stay was AWESOME and more then expected after seeing the views each evening"s ( connection was with Lori Patch whom maid my stay that much better.The last question on the review is would you recommend this property to a friend...I have already told many friends that they absolutely have to stay here !! 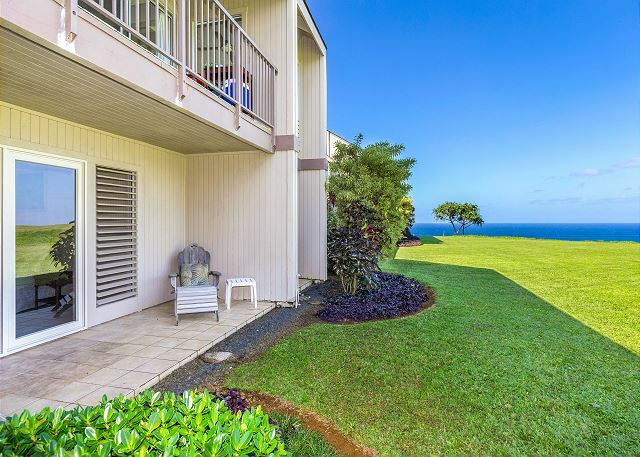 The 4 of us rented a lovely condo on the ground floor in Princeville. The unit was tastefully furnished and allowed plenty of space to lounge and yet have seperate bathrooms and bedrooms. It takes a while to get used to no AC but this is Kauii where it is rare. The grounds were manicured including motors at 7AM. A well equipped , working kitchen enhanced meal prep and beach gear was a pleasant addittion. A very solid place to stay. 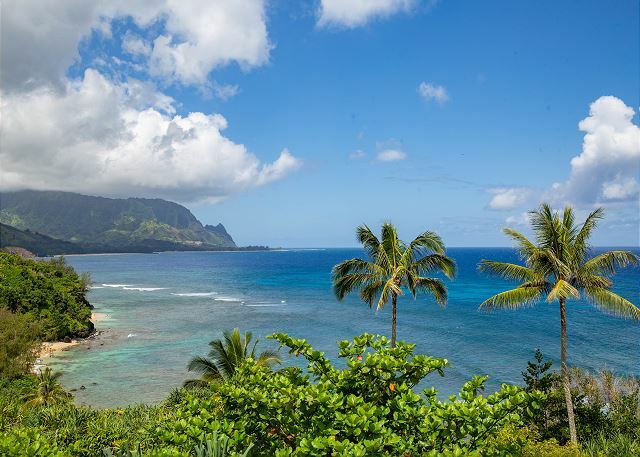 Princeville is the place to be in Kauai and there is no reason why you should not stay here. Sunsets are magnificent. We loved the condo! Not fancy, but very comfortable, clean and cozy. Ocean View was awesome! Perfect place to return to at the end of a long day. Great customer service and we look forward to returning! 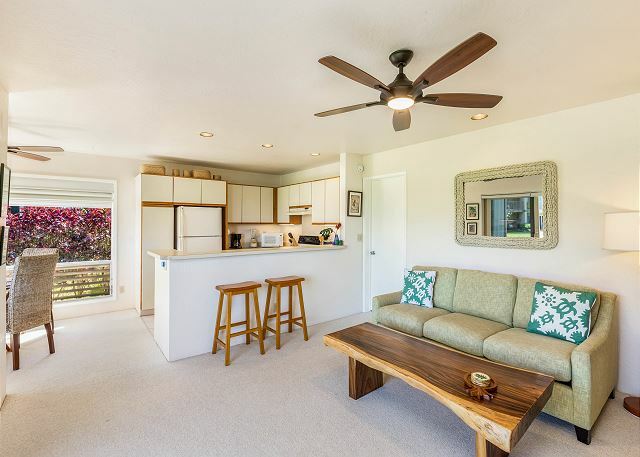 My husband and I enjoyed having this spacious 2 bed, 2 bath, 2 patio condo to come home to while in Kauai. 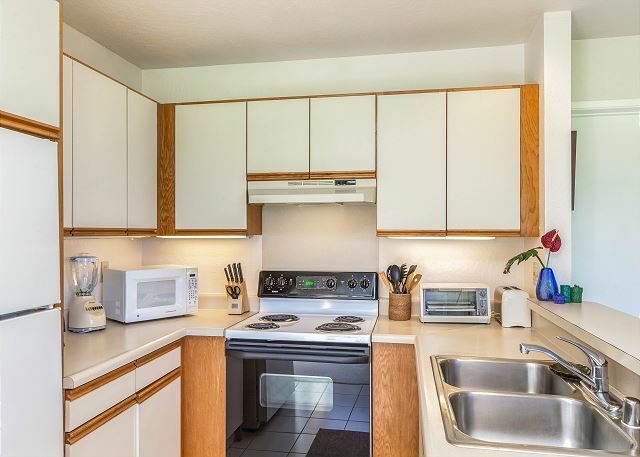 Clean, comfortable, we'll stocked appliances and a sensible layout. Plenty of beach towels, a cooler and other supplies for day time outings. And a very reasonable price. Close to beaches, grocery store, restaurants and more but a quiet and we'll landscaped complex. There was a BBQ advertised but we could not find one, however. We recommend the hosts provide a few more kitchen sundries, like cooking oil and a few common spices. We stayed 12 days here and had a great time..great location. Beautiful, spacious unit..quiet and well stocked with everything we needed to cook etc. It was our first time in Princeville, Kauai. Everything about the property, the location and the service was excellent. We enjoyed all the outdoor activeties that were available in Hanalei ...kayaking, paddle boarding, surfing, snorkelling ,eating and shopping. The Aloha Spirit was everywhere. We attended the Kamaluka luau at the historic Kilomana Plantation in Lihui which was a Hawaiin Experience. We wish there was a luau closer but the one in Hanalei was closed because of a fire. We did the Pearl Harbor trip which ended up to be an 18 hr. Day because we had to be in Lihue for 5:15 am to catch a flight at 6:15 am. it was worth it. The beaches are numerous and beautiful and discovering them a real treat. Every night at sunset we would join other people in celebrating another joyous day on the north shore of Kauai...Malhalo! A most enjoyable time on our favourite island. Pali Ke Kua is ideally situated overlooking the Pacific. The views are glorious, the landscaping is beautiful and very well maintained. The unit we rented was well supplied with everything needed to enjoy cooking and relaxing. The buzzing of the Albatross daily was an added bonus. My wife and I highly recommend Pali Ke Kua. Our party loved the location and everything about Pali Ke Kua #138. From the lanai you have a lovely view of the ocean. It's a very short drive to Hanalei, Kapaa, the lighthouse and lots of other great places to visit. Great paved walking paths with beautiful views. The condo was very clean and comfortable. The layout is perfect for two adult couples. Plenty of privacy while still being in the same condo. Really great bathrooms!! We would most definitely stay there again...can can't wait to! Aloha and Mahalo! We had a wonderful family holiday at #138 (my son and his family were in #233). The condo was clean, spacious, with everything needed for a relaxing holiday. Lori Patch took care of our every need kindly providing us with a baby portable crib, buckets and spades, sun umbrellas (which sadly were not needed as it was very rainy! ), etc. Lori was responsive to all our e-mails prior to arrival, and answered phone calls and questions upon arrival. The Pali Ke Kua complex is a perfect spot for a family holiday (or a single person too). Safe, glorious views, easy beach access. We cooked most of our meals at the condo and had all we needed. For a larger group a few more coffee cups would be good, also tall glasses. Another (minor) addition, it would be nice to have larger beach towels that are cotton (polyester does not dry well). The condo had EVERYTHING you could need for a trip to Kauai! It was immaculately clean and well maintained. The kitchen held every pot, pan, dish & gadget you could imagine...making meals at "home" so easy. Lovely, comfortable and very clean place in a beautiful and quiet neighborhood. Everything we needed was there and the property description was accurate. Was there for a week with my girlfriend and another couple. The condo had everything we needed. It wasn't over the top fancy but clean and comfortable. A complete pleasure to stay here. Prime location for a family vacation at a great price. We had a wonderful time the unit was in the perfect location and I would highly recommend this location we will most certainly return. 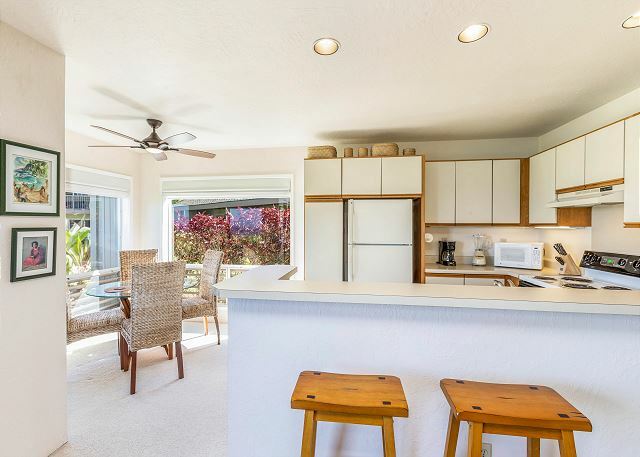 We had a fabulous stay at this condo in March It was very clean, great location, watched whales breaching from our lanai. We loved the ground floor, my husband and son threw the baseball around. There was everything we needed, except one thing, a big pot for pasta etc, we managed with the little ones, but a big one would complete the kitchen supplies. I missed my teapot too. Would highly recommend this place to anyone. We will be back soon I hope. We had an amazing time in Kauai. Our corner, ground floor unit was a great location. We watched whales from our lanai. It was spacious and clean. There is not much to complain about but I would have liked to have better beach chairs, specifically the Tommy Bahama chairs that recline. It also would have been nice to have snorkelling equipment availabe too. Other than that, the condo was great. Mahalo!! My sister and I had a wonderful stay at Pali Ke Kua. 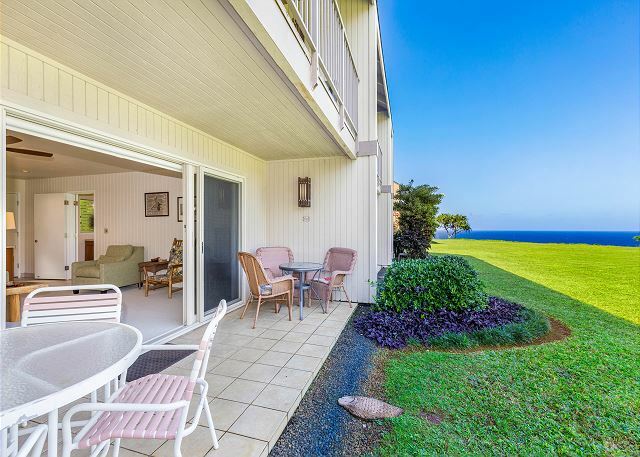 Ocean views with whales, a short walk to the Regis beach front bar and an easy drive to all the North Shore of Kaua'i has to offer made our stay here perfect. The condo is in a great location if you want to be on the N shore. 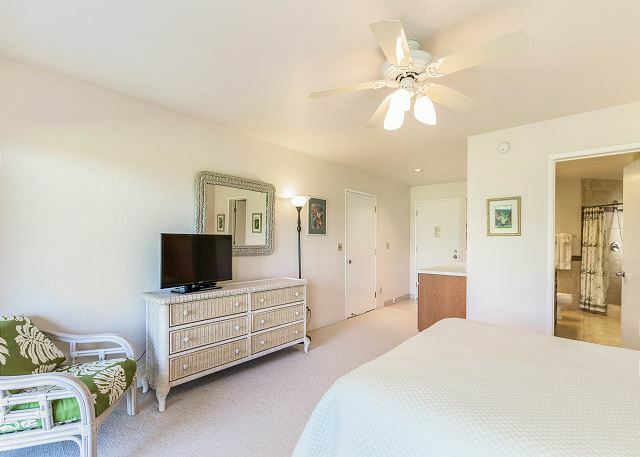 Very comfortable and clean with a very nice view of the ocean from the condo. 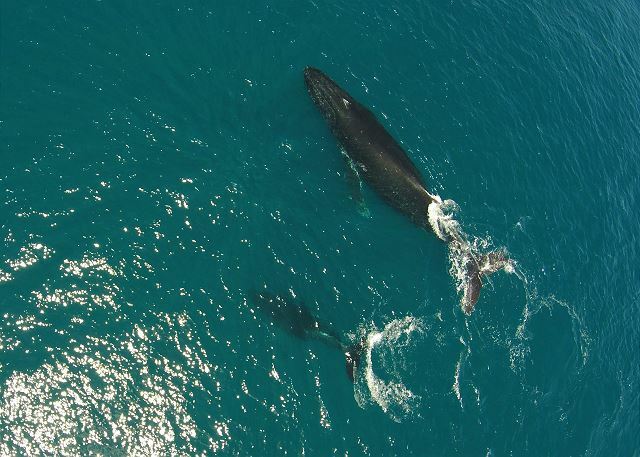 In mid-February the whales were very active and visible from the lanai (bring good binoculars!). The nene were friendly and the Albatross beautiful as then soared overhead. Beds were very comfortable and the cooking utensiles were adequate. All in all, an excellent stay. Beautiful location and comfortable condo. I have stayed here three times in the last year or so. The location is very good, and the unit is in great condition. If there are upstairs neighbors, you will hear them. Only one problem. They did not let us know there was a pool. Great time had by whole family! The view and grass area infront of the unit were amazing. From the cliff we saw an amazing sunset, a whale breaching, turtles swimming, albatross flying over head and a monk seal. Our children 5 and 3 years old loved seeing all the animals and the grass out back allowed for some close encounters woth the local Na Nas and some Keike. The unit was very clean. Only complaint was the internet connection only worked right before we left. Too funny we were able to get our emails the day we were leaving and our boarding passes home! oh well we still enjoyed ourselves after all we were on vacation. Just goes to show you get what you need but not always what you want. We didn't need the Internet. Would recommend to anyone wanting to get away from it all. We would stay here again just tell our friends and family that we would be unavailable by Internet next time. Aloha! I was very pleased with the property, it's location and cleanliness. View from the property was wonderful and getting down to the beach was good exercise! Our last week the weather was stormy and it rained a lot, so would recommend going later in the year. Nevertheless, we had a great time and would definitely go there again. 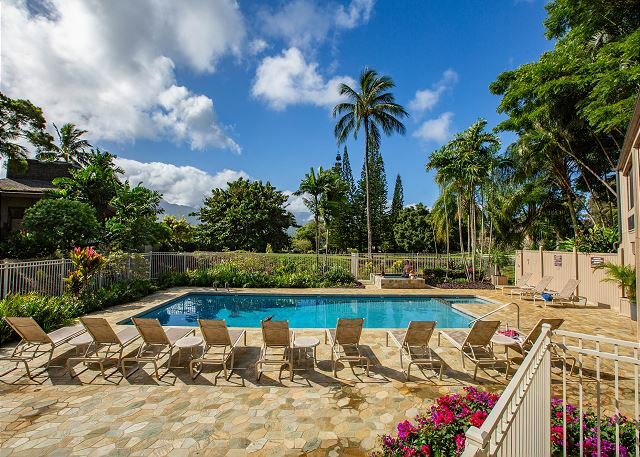 We recently stayed at Pali Ke Kue on our trip to Kauai and were very impressed with the calibre of this property, it's beautiful location and amenities. We wished they had a more comprehensive recycling system for organics and recyclables other than just glass, cardboard and some pastics, but that's obviously not the fault of this resort. It was an impeccably kept property. 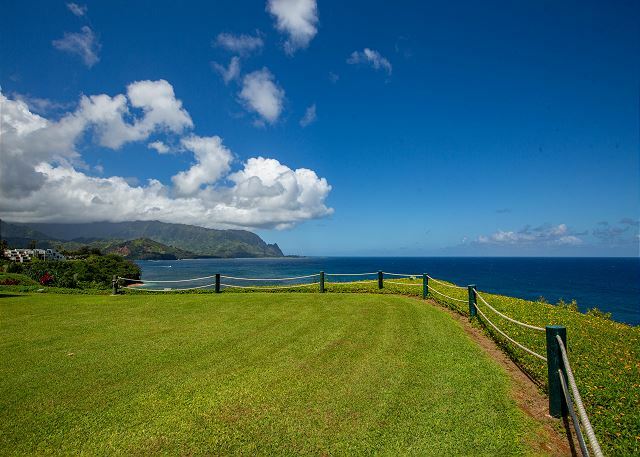 The Pali Ke Kua (PKK) condominiums in Princeville offer exceptional grounds, locations, and views. We stayed in Building 9, Unit #138, which is located on the bottom floor of a two-story building. .
PKK #138 is a two-bedroom unit with two complete bathrooms, both with showers, no tubs. 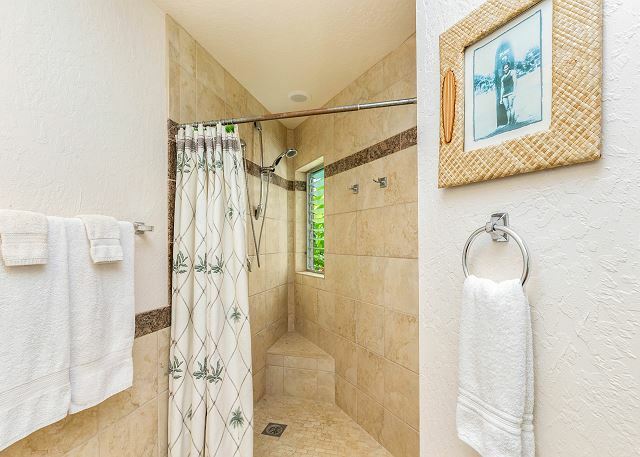 The bathrooms have been tastefully remodeled with solid countertops and tile floors and showers. The kitchen has not been remodeled and could use updating, although it remains functional and adequate. The décor is standard Hawaiian, not upscale but adequate. There were several small issues, some of which were resolved before we left, and some of which were not. All in all, we had a wonderful stay on Kauai, and Pali Ke Kua #138 is a bargain of the first order. 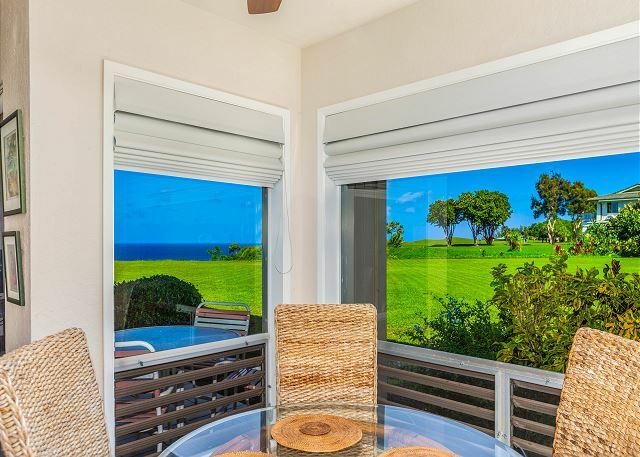 There is a partial ocean view from the dining nook, and a few short steps across the broad expanse of beautifully manicured and landscaped grassy area affords one unforgettable views of the ocean and mountains. Priceless. The unit could use some TLC, but recommend it? I do. As for us, we love Pali Ke Kua so much that we are going to bite the bullet and rent one of the upstairs units on the bluff. They rent for about 50% more than #138, but the views are priceless. Still and all, #138 offers major “bang for the buck,” and I recommend it. The management agent was extremely helfpul and available at all times. The property was exceptionally clean and had all the amenities plus more than expected. The only exception to this was dishwasher detergent and the kitchen cupboard doors are needing replacement as well as general rot of the kitchen counters. The ants were a problem as well, but you can hardly blame ownership for ants. Over all the price to value was very good. Just a heads up: The electronic equipment is outdated (VHS machine, bulky old TV's, etc.) We didn't mind because we were there to hike, swim and relax; not watch TV. It might bother other people. This was the perfect setting for our first stay in Kauai. Easy access to everything and included everything needed (except more time). We recommend this place and will stay here again in years to come. This is a very comfortable and delightful unit. Clean, quiet and a great location - will come again! We were very pleased with our whole experience - making reservations was easy and our questions were answered promptly. We were in a beautiful location with a view of the ocean from our breakfast table (we might try for one with a full ocean view next time). The area was quiet and well maintaied and the condo was in good shape. The bathrooms looked like they had been renovated recently and they were really nice. Having a washer and dryer was great! Our only complaint was that the bed in 137 was a little on the hard side, but the bed in 138 was very comfortable. Overall a good experience. The price is reasonable too. We will definitely come back and will recommend Pali Ke Kua to our friends and relatives! We had a wonderful and relaxing time staying at these condos. It was perfectly located and had access to a beautiful, secluded beach. Great for morning walks/runs. The views were gorgeous. The condo was spacious and clean; it had everything we needed! I definitely recommend others to stay here.